The RN Inter Region Team Racing Championship took place last weekend in 2000s in Portsmouth Harbour. A total of 36 RN sailors in 9 teams turned out to compete in 2 days of intense competition run from the Royal Navy Sailing Centre (RNSC). Saturday morning began with a 2 hour postponement waiting for the wind which eventually filled in from the North East. The teams got afloat around 1100 having been split into 2 leagues and began racing. There was close competition in both leagues with only BRNC taking a clean sweep. After 16 races, the Gold and Silver fleets were established for the Sunday. The Gold fleet would consist of BRNC, West 1, East 2 and Bristol URNU 1 while the Silver fleet included West 2, East 1, North, FAA and Bristol URNU 2. The RNSA AGM, Prizegiving and Annual Dinner had been programmed to coincide with the Holt Cup again allowing many of the competitors to attend. The Wardroom in HMS Nelson hosted over 100 RNSA sailors for a thoroughly enjoyable evening. The effects of such a superb evening were still being felt by some as the competitors assembled at RNSC for the deciding races. Despite the light winds and strong tides, the race committee pushed through the 16 race programme only having to abandon once for lack of wind. The Silver Fleet was a closely fought affair with West 2 and FAA each taking 3 victories. West 2 emerged victorious based on the head-to-head between these teams. In the Gold Fleet, BRNC proved too strong for West 1 taking 3 victories from 3 races and therefore the Championship. RNSA CEO Cdre Phil Warwick then presented prizes to the winners and runners up in RNSC on Sunday afternoon. 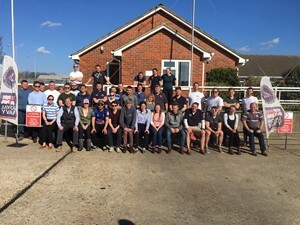 Particular thanks go to Nick, Tracy and Oli for running all 32 races flawlessly and to Wayne for sourcing the boats and devising the competition format. We are also very grateful to Lee and the Sailing Centre Staff for making the centre available and to the safety craft volunteers Adrian, Bill and Dave for giving up their time to support. The weekend was also a selection event for the team to represent the RN at the Inter Services event at the end of April. Good luck to the RN team attending – here’s hoping we can retain the title!